Last week I attended a press dinner at Angus Club Steakhouse. Besides having a great time catching up with Nisha, I enjoyed the dinner immensely. This midtown steakhouse is quite different from any other steakhouse I've been to. The interior is beautifully modern, devoid of plush carpeting and a stuffy atmosphere. The wood walls give off a very unique look, and there are many different nooks with curtains that make perfect spaces for more intimate group dinner options. 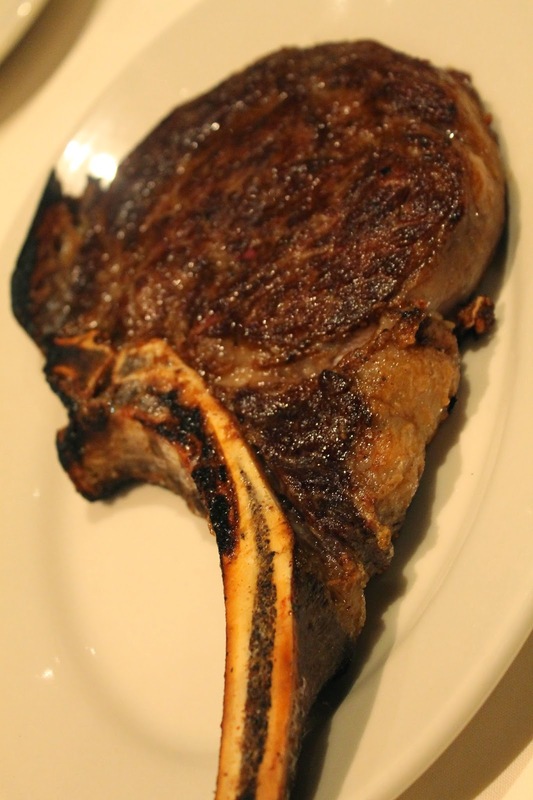 Angus Club Steakhouse offers USDA prime black Angus beef steaks-- all of which are dry aged on-site for 30-35 days. The restaurant also stands out in that although their side dishes are typical for a steakhouse, they are prepared more uniquely. I found them to actually be more impressive than the main dishes. The majority of the tables in this restaurant are on the lower floor. I liked the traditional antique-looking lights paired with the modern decor. One of several dining nooks, great for a birthday or business meal. 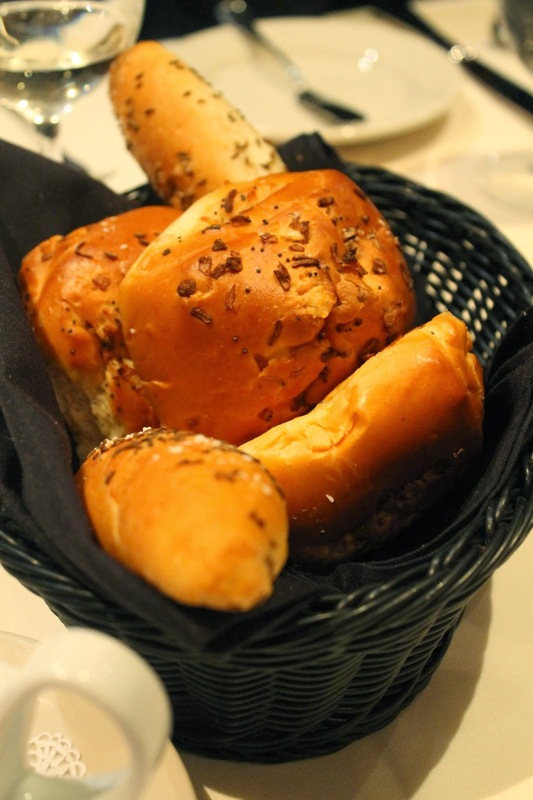 The onion roll was soft and fluffy, it was hard to stop myself from finishing two. (I needed to save room for everything else!) The thin baguette was a little too hard, but went better with butter. I personally don't see the appeal in thick cut bacon. I love bacon thin and crispy! Although this was on the chewy side, I did really enjoy the charred flavors. My favorite entree of the night! Incredibly well-seasoned and cooked just right. It's taken me a while to start enjoying medium rare steak. My bf and sister are always pushing me to do so because it's the "right" way, but I'm slowly changing my ways, and becoming more okay with it because fine, it is more juicy and delicious that way. I admit I've never been to Peter Luger's, but I do know that this is how the steak there is served. It's a great idea, serving the steak on a hot plate so that it may continue to cook a little longer if one prefers that. Beautifully presented, but I found the steak to be too tough overall. I prefer not to have to chew until my jaw gets tired. Cooked perfectly, but tasted slightly too fishy. If every other steakhouse and brunch spot could copy these amazing home fries, it would make me very, very happy. I especially loved the crispiness and the abundance of caramelized onions scattered between pieces. Truly the best dish to accompany steak. I'm not sure how Angus Club Steakhouse prepares this, but there was something about it that made it so much better than how I've ever cooked it at home. Not pictured here, but the creamed spinach was also unbelievable. It wasn't your usual buttery, rich, heavy creamed spinach. It tasted like simple, clean spinach with a touch of salt. Delicious. This is likely the best crème brûlée I've ever had. It really stood out because of how custard-y it was. I'm not sure if more egg was used, but it made the dessert feel lighter and more decadent all at once. My first time trying a coconut tiramisu, and I must say, it's one of the most amazing desserts ever.